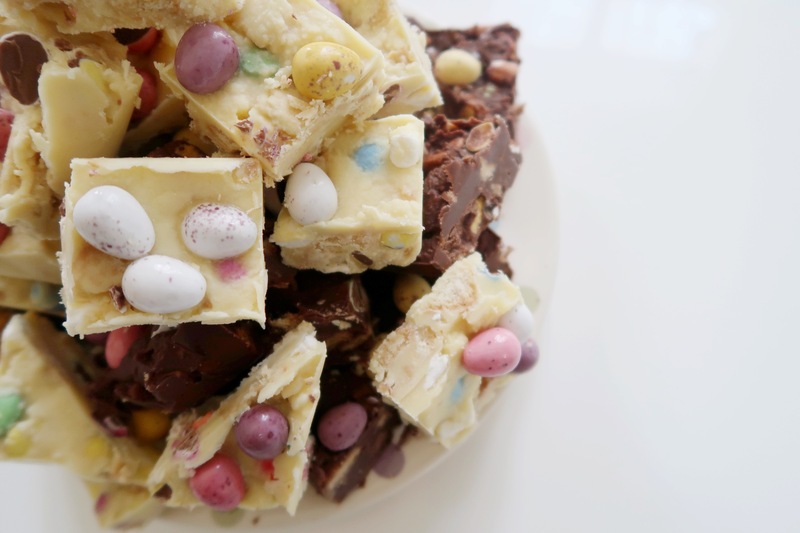 ‘My ultimate creme egg rocky road has been ever so popular so I thought why not give it a bash at adapting it to white chocolate (my nephew Harry’s favourite!). I gave this recipe a whirl before the end of term and made a huge batch for the boys in my day house at school and blow me down not a single piece was left’! 1. In a bowl over a pan of simmering water melt your butter, white chocolate and golden syrup. Now white chocolate is a total pain in the backside to melt so do it VERY SLOWLY but should it start to go claggy add your 1/2 tbsp of vegetable oil, mix to loosen it up. 2. Place your custard creams biscuits in to a large sandwich bag and give them a good old bash until they have broken up but are not reduced to just crumbs. 3. Once the chocolate mix has melted remove from the heat and stir it the smarties (i love the flecks of colour they give), biscuits, and marshmallows and give a jolly good stir. 4. Tip your chocolate mix into a lined tin. 5. Scatter the Mini Eggs on top. 6. Pop the mixture in the fridge to harden up for at least an hour and a half. 7. Slice up into big fat slabs and enjoy!! What I love about this recipe is its simplicity and how pretty it looks especially teamed with a milk chocolate rocky road piled up high on a plate – why not give it a whirl!